"Do we have enough people to hold a meeting?" There is only one way to find out the answer to that question, and that is to refer to your In/Out Customer White Board. You no longer will have to search every office cubicle or individual offices to find out if your co-workers are in the office. You can refer to our Custom White Board to see who is currently in the office, who is at lunch, and who is gone from the office for the day. 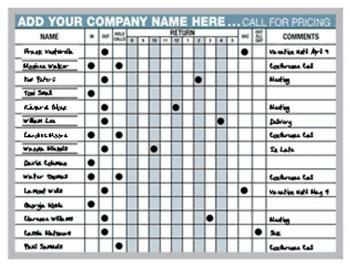 The 18 by 24-inch attendance board easily hangs on any wall in your office. Our durable construction provides you with years of use. 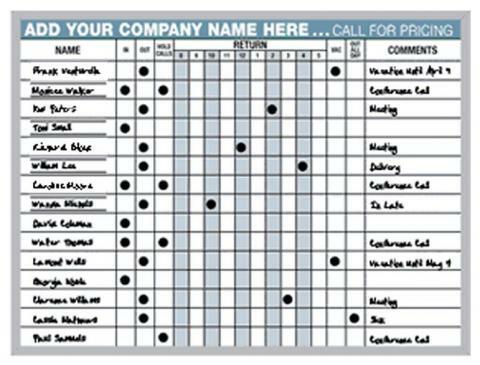 The easy to wipe surface hold spaces for fifteen names, though you have the option of ordering a larger version of the Custom White Board to hold more names. 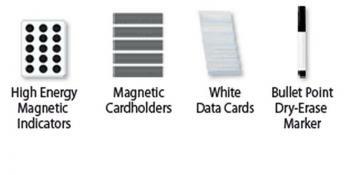 We provide a kit that includes black magnetic indicators, black cardholders, white data cards, and a black bullet point dry-erase marker. 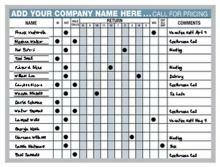 Personalize the new attendance board by adding your company name.